A Masham family butchers business that will celebrate its centenary in 2021 has invested approaching a six-figure sum to double its sales space with a brand-new delicatessen offering. W S Rogers has supplied customers in the village and beyond since William Stanley Rogers opened for business, originally in Ripon, three years after the First World War. Now his grandson Anthony, who has been in the business for 35 years, has fulfilled a long-held ambition to expand into delicatessen ranges, including antipasti, charcuterie and cheeses, all sourced locally wherever possible. “When the former florists next door came up for sale we decided to take the plunge and our seven members of staff worked tirelessly to get the new operation up and running just in time for Christmas,” said Mr Rogers. “The hard work paid off and we had an excellent festive trading season, despite increased competition from the supermarkets and online traders. 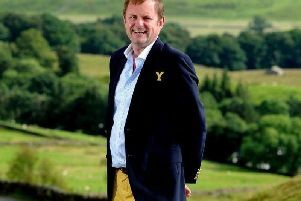 “We have an extensive and very loyal customer base and with Masham firmly on the tourist track and the Tour de Yorkshire round the corner we feel confident about our plans to expand further into beverages and hot sandwiches,” he added. The popularity of delicatessen, speciality and fine foods has grown enormously over the last 20 years, as consumers’ tastes have become more adventurous. Customers are also increasingly demanding high-quality produce from local suppliers, and organic and free-range options are increasing their market share.